Emperor, aka Turbo Emperor, is a 3 year old brindle male born February 4, 2008. His sire is Turbo Penske, and his dam is Silver Empress. 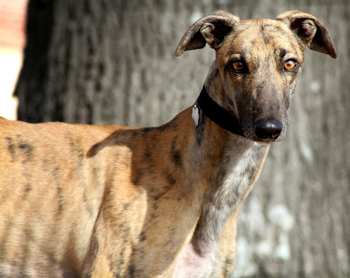 Emperor has 110 races to his credit starting August 12, 2009, at Derby Lane Track in St. Petersburg, FL, and ending there December 18, 2010, with a dropped shoulder muscle. Although this was a career ending injury for him, it in no way affects his quality of life as a companion pet. 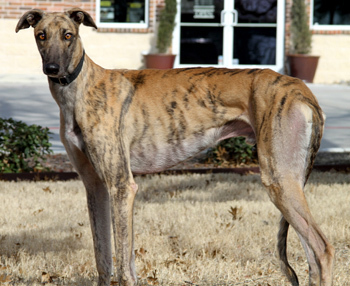 Emperor was a semifinalist in the $50,000 2010 Fall Sprint at Derby Lane, and a greyt grade A racer! It is not known at this time if Emperor is small animal tolerant, but he is NOT cat tolerant.